Financial abuse is sometimes the hidden by-product of domestic violence. Qudsia Raja, policy director for the National Domestic Violence Hotline, says few of the female victims of domestic violence that she has counseled could identify financial abuse until leaving the relationship. Financial abuse is high, though: Ninety-four percent of women who were victims of what’s called “intimate partner violence” have experienced economic abuse, according to a 2012 study of women participating in a financial literacy program. A national public opinion survey conducted by Allstate Foundation Purple Purse found financial abuse is often difficult to understand. More than half of respondents were “unaware of the impact finances have on domestic abuse victims,” and 47 percent were “not very” or “not at all” familiar with financial abuse as a form of domestic violence, according to Purple Purse, an awareness campaign that began in 2005 and has received support from celebrities like Serena Williams. “If someone in a relationship is keeping you from money or spending it, that’s a conversation to be had,” Raja said. Here are five signs that can help you determine if you are in a financially abusive relationship. Your significant other frequently checks your bank account but gives you no access to theirs. Raja says an abuser may use bank accounts to track the amount of money their spouse spends, monitor what is purchased or even track the location of the victim. If your spouse or partner frequently checks an account, particularly accounts opened in your name, this could be a red flag, she says. She adds that this warning needs to be put into the context of your specific relationship. See if there are other signs, such as if your spouse or partner asks frequently about money or your whereabouts, or even if this happens alongside other forms of abuse, such as physical abuse. You’re scared to ask for money to spend. 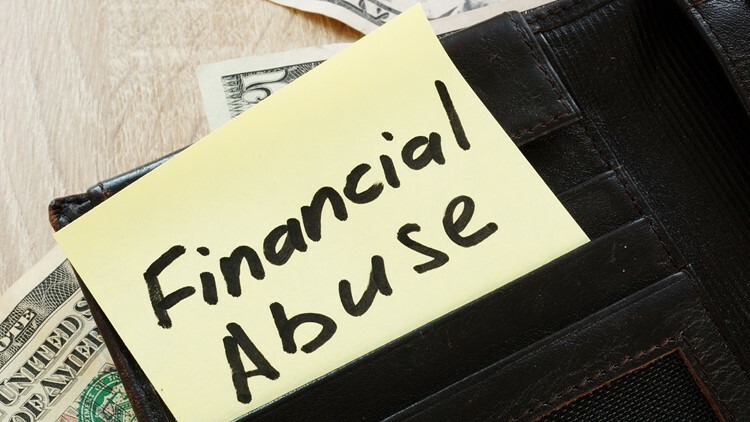 In situations of financial abuse, an abuser may decide when or how much their partner can use assets, such as cash or credit and debit cards, according to the Denver-based National Coalition Against Domestic Violence. When an abuser does not provide access to money, they are not allowing them the financial freedom to consider the possibility of leaving the relationship, Raja says. “That’s a very textbook way of controlling someone and keeping them in a relationship that they might want out of,” she said. Tracking a household budget as a couple and keeping tabs on overspending isn’t inherently abusive. It’s when one partner takes the level of control too far that it can be harmful. As an extreme example, Raja says if you are scared that your spouse will retaliate if you spend $5 in one day, then you are facing financial abuse. Your SO opens credit cards in your name without telling you. If you have shared your Social Security information with your partner and notice new credit cards in the mail, or that person using credit cards you didn’t realize they had, this could be a red flag for financial abuse, Raja says. Abusers may use your Social Security number and other identifying information to request new credit cards and rack up debt, which can ruin their partners’ credit. The situation can prolong a cycle of economic abuse. With damaged credit, it is difficult for a victim to apply for jobs or homes. “That coerces them to stay because it inhibits their ability to leave,” Raja said. Your partner often reminds you of their financial dominance. Statements like “This is my house” or “This is my money” are considered financial bullying and are common in situations of economic abuse, says Emily Johnson, a CFP and certified divorce financial analyst (CDFA). Abusers use these types of statements to gain power over their partner. For married victims, Johnson says to remember that even if most of the couples’ assets are under one name, that doesn’t mean they would be left with nothing. She suggests researching what marital property — acquired after a marriage — is included in your state to know what assets a victim can claim. “There may be assets that one person accumulated, but this is a partnership that was agreed upon by your spouse,” said Johnson, managing director of financial services firm Divorce & QDRO in Hilton Head Island, S.C. Your partner prevents you from working or takes income earned from your work. To prevent a partner from making their own income, an abuser may stop their partner from getting a job. An abuser could demand that their partner quit their job, prevent them from searching for or attending a job, or even harass their partner at work, according to the National Coalition Against Domestic Violence. Between 36-75 percent of domestic violence victims reported their abuser bothering them at their place of business, according to a 2015 study by Canadian researchers published in the Journal of Occupational and Environmental Medicine. To break free, Raja says any victim of financial abuse should educate themselves on household finances, even tasks such as balancing a checkbook. However, she adds that it is a myth that the victim is always uneducated about finances. In fact, in recent years, the victim is at times the main breadwinner or the sole source of income for a household. But a woman may face financial abuse because she is manipulated in other ways, often through sexual or physical violence. Hotlines or programs for victims can provide a case-by-case approach to getting safely out of dangerous relationships, she added. “When you are in it, you never really realize it until much later,” she said. The post 5 Signs You’re in a Financially Abusive Relationship appeared first on MagnifyMoney.